FINALLY! Shu Uemura is opening its doors in Trinoma. And I really meant doors there, for they are moving from the temporary location they just had (the one near Guess and Mary Grace) to a bigger store! As the picture says, it will be located at the 3rd level near Topshop and Dorothy Perkins. No longer will we shy away in testing and buying make up, because personally, I am not comfortable trying products when a lot of people walk around and stare at you. The lane that they were in before was just too busy to begin with. So thank you Shu for living up to your promise that the kiosk was just a temporary location! Here is another GOOD NEWS! 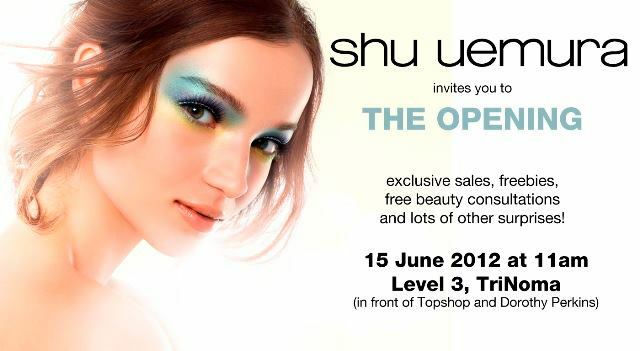 Shu Uemura is giving out exclusive SALES, freebies and FREE BEAUTY CONSULTATIONS! So if you are running out on their very amazing cleanser, or you just want to add another pair of falsies from their collection, OR you just want to stock up on make up, JUNE 15 is the right time to visit SHU UEMURA! 3. Retweet about the Trinoma opening to double the chances of bagging that P5000 worth of Shu products. Only one winner will be chosen randomly by a computer from both the shares and retweets until June 15, 11:59 pm. So spread the word ladies! And don't forget to drop by on the 15th for the store opening is a win in itself already! See you around!